I’m finally getting around to sharing a donut recipe with you, and trust me, I think this one was worth the wait. These Pumpkin Pecan Protein Donuts are perfectly spiced for fall, with a pecan topping and chocolate drizzle. But as decadent as they sound, they are totally clean eating and loaded with fibre and protein! As a child, I loved a good donut. Nothing fancy, just a plain old-fashioned donut with chocolate frosting. Our local grocery store sold them from their bakery and actually supplied our elementary school with donuts every Tuesday for “donut day”. I’m not sure why I remember that, but I guess it stuck with me. These days, a school would probably never do that. But we are talking 30 years ago. Oh gosh, did I just write that? 30 years!?! Yikes, that hurt a little! Anyways, we would place our orders with the teacher in the morning (one hand for one donut and two hands for two donuts) and donuts would magically appear at recess time. I would say it was a nice treat, but it’s not like we didn’t have treats every day of the week. Aside from donut day, we had the option to order ice cream for recess. In fact, I don’t remember any other options. Seriously! There was no such thing as ordering a yogurt or a piece of fruit. Nowadays, I’m happy to report that my mid-morning snacks (AKA recess) are much healthier. 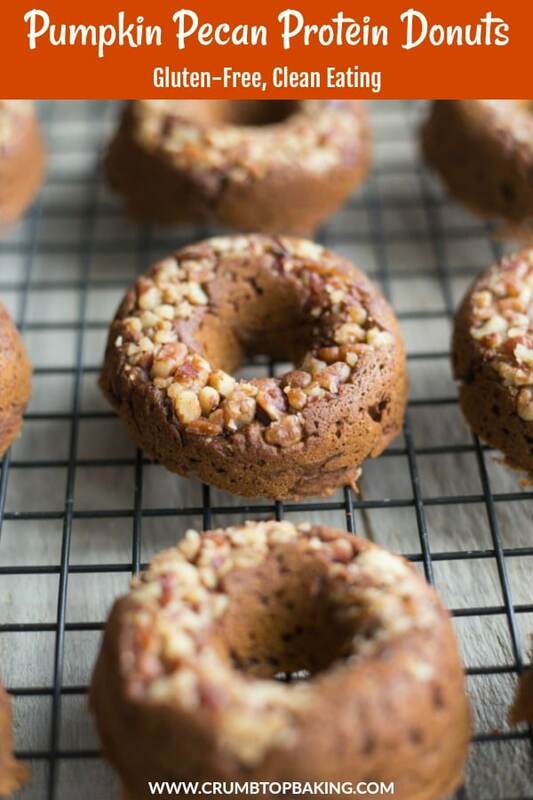 And my donut days usually involve some sort of flourless or protein donut….. like these Pumpkin Pecan Protein Donuts. 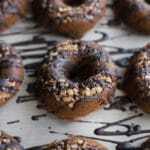 These donuts are made with gluten-free oat flour (so not quite flourless but wheat free! ), protein powder, pumpkin puree, dark chocolate almond milk, egg whites, olive oil and honey. And, of course, pumpkin spice! 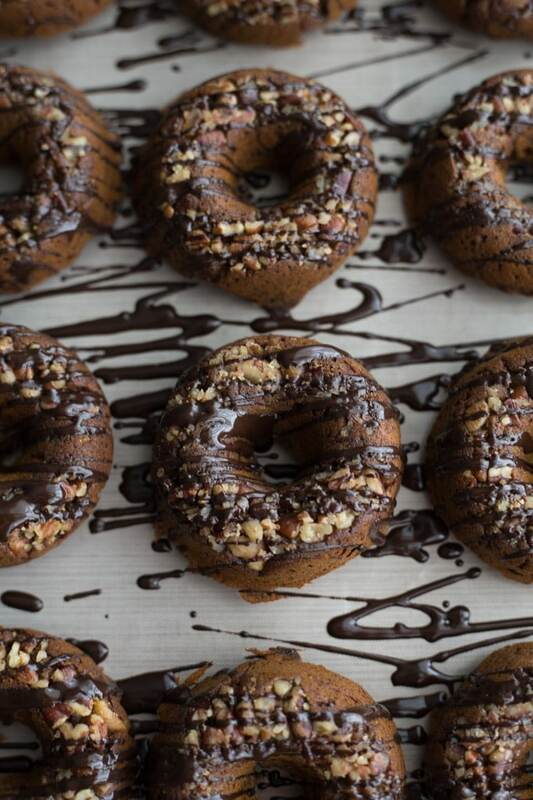 Over the past few months, I have been experimenting with countless flourless protein donut recipes. But for one reason or another, they never turned out the way I wanted them to. 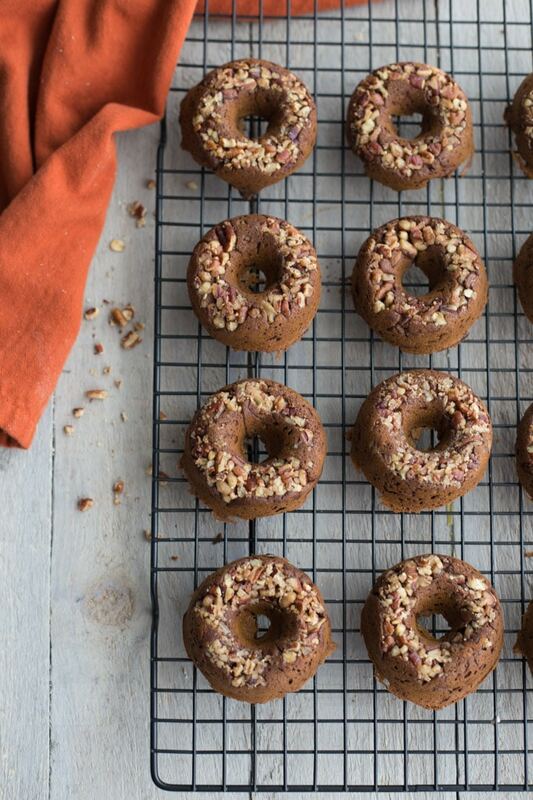 These Pumpkin Pecan Protein Donuts, however, turned out just right. They have the perfect donut texture with the right amount of sweetness from the vanilla protein powder, chocolate almond milk and honey. And the pumpkin spice is noticeable without being overpowering. By now you must know that I like my sweet treats to have some sort of topping or drizzle. Cases in point include these energy balls, this zucchini cake and these granola topped muffins. There is something about a topping that just adds a nice taste and texture, and let’s face it, toppings make for a pretty photo too 😉 . 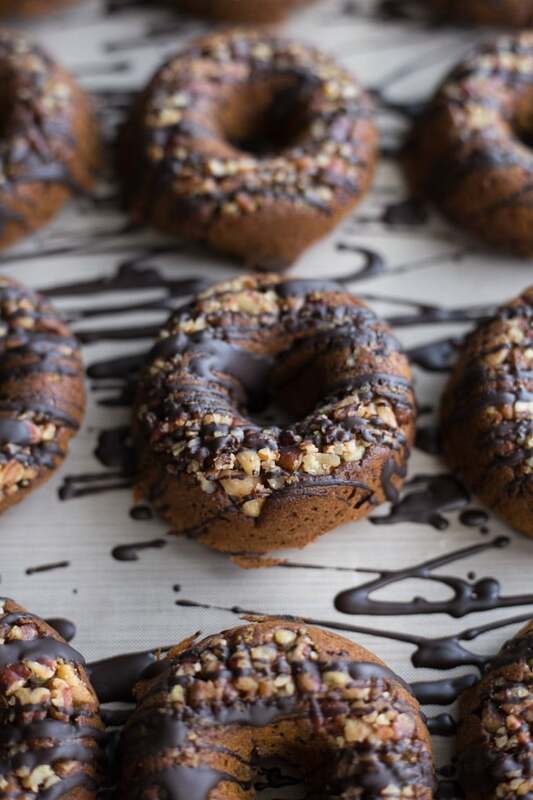 So no surprise that my favourite part about these Pumpkin Pecan Protein Donuts is the topping – the pecans and the dark chocolate drizzle. Because what’s a donut without toppings? And these toppings won’t fall off since the pecans are baked right into the top! 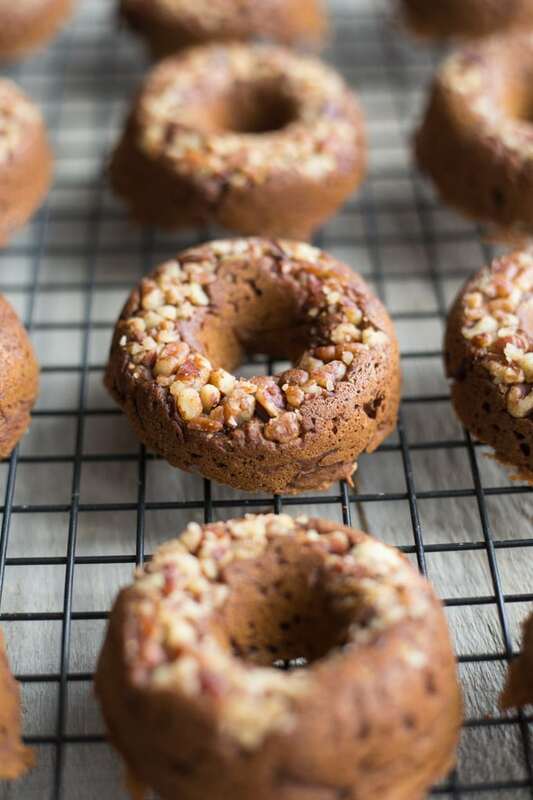 If you prefer, you can totally forego the chocolate drizzle and you can even make these donuts without the pecans and just call them pumpkin spice protein donuts. Either way, they are still super delicious! 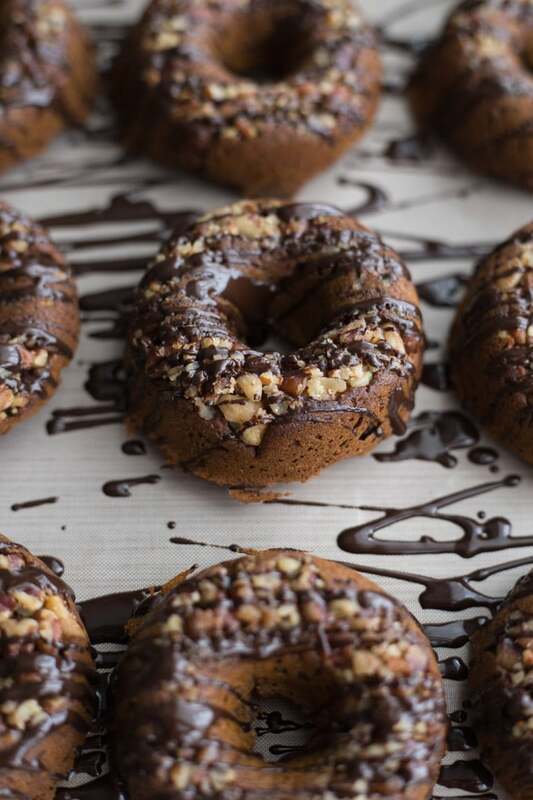 These Pumpkin Pecan Protein Donuts are perfectly spiced for fall, with pecans baked into the top and a dark chocolate drizzle. 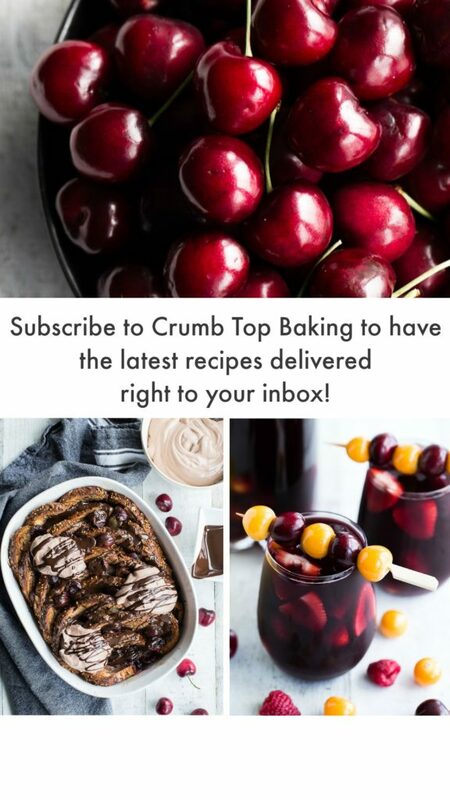 But as decadent as they sound, they are totally clean eating and loaded with fibre and protein! Pre-heat oven to 350 degrees and grease a 12-cavity mini donut pan. Sprinkle the chopped pecans into each cavity. (Once the donuts are turned out onto the cooling rack the pecans will be baked into the top). 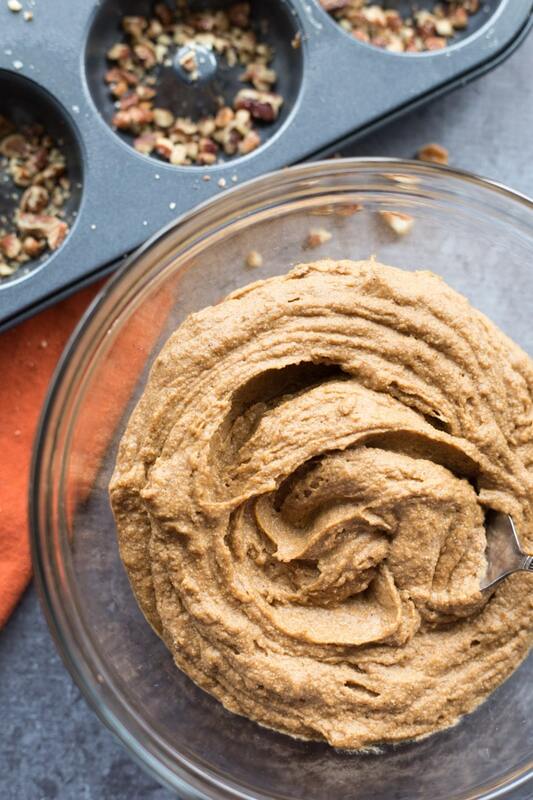 In a large bowl, add the oat flour, protein powder, pumpkin spice, baking soda, salt and cinnamon. Stir until combined. In a medium-sized bowl, add the pumpkin, almond milk, oil, egg whites and honey, and whisk until well combined. Make a well in the middle of the dry ingredients and pour the wet ingredients into the well. Stir until well combined but don’t over mix. The batter will be thick. Spoon the batter into the donut cavities, spreading evenly but being careful not to disturb the pecans on the bottom. I did this by spooning little bits of the batter into the cavities and smoothing it out with the spoon. Bake for 13-15 minutes, or until a tooth pick inserted in a donut comes out clean. Do not over bake as the tops of the donuts (including the pecans) may burn. Remove the donuts from the oven and let cool in the pan for a few minutes before turning out onto a cooling rack to cool further. Meanwhile, in a small microwavable bowl, add the chocolate chips and the coconut oil and heat for approximately 30-40 seconds. Remove from the microwave and stir until the chocolate chips are fully melted. Drizzle the chocolate over the donuts. Store in an airtight container on the counter and enjoy within 2-3 days. If you don’t have dark chocolate almond milk, you can use vanilla, original or unsweetened almond milk. Just note that this will change the taste of the donuts. They will be less chocolatey and not as sweet. The chocolate drizzle is completely optional, and the donuts taste great without it. 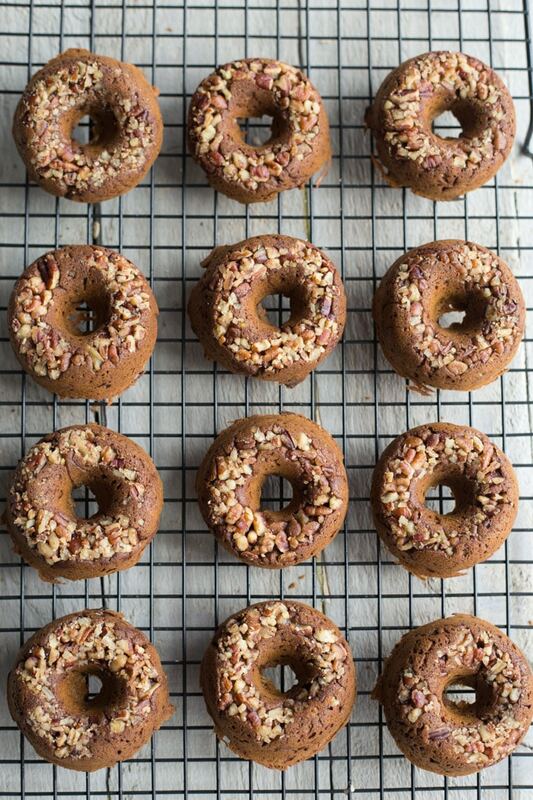 You could even bake these donuts without the pecans and just have pumpkin spice protein donuts. If you decide to go with the melted chocolate, you can drizzle it on with a spoon or you can pour it into a ziploc bag and “pipe” it on. To do this, just let the melted chocolate cool before pouring it into the ziploc bag. Once in the bag, cut a very small hole in one corner and use it as a piping bag to drizzle the chocolate on the donuts. Thanks Albert! I’ve experimented with a number of different donut recipes, but this one is my favourite by far! Pinned on my Pinterest board to try out later. Looks so so yummy. My daughter loves chocolate (who doesn’t), so I’m sure this will be a hit. Thanks HeeJee! You can’t go wrong with chocolate and pecans! I hope your daughter likes them!